I've finally put together a gallery page to showcase some of my 3D artwork. Most of it is abstract backgrounds - things that work into my graphic, video, and website design work. I use blender 3d software, for my 3d work because it is open source and ultra-powerful. Take a look at what I've learned in blender in the short time I've been using it. In addition to the 3d gallery, I've also included a section of the website specifically for providing free downloads to the 3d design community. The software I use, Blender, is free and open source, and in that type of community there is a lot of sharing, so my download section is a tiny way to give back. The website was just launched, but I will hope to change which models I provide in the download section. Check back soon for new ones. 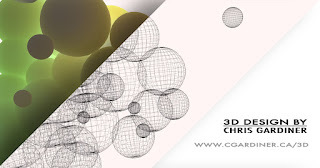 Here is a playlist of my 3D work and variety of projects I've used 3D graphics in. The playlist is in YouTube so it will be continuously updated as I upload new things to my channel.